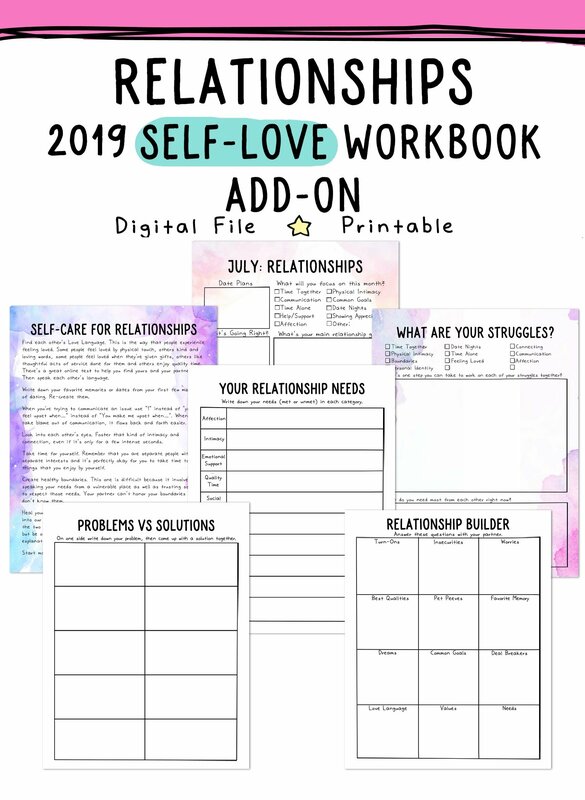 These add-ons are bonus worksheets specifically designed to accompany the basic Self-Love Workbook. Self-Love and Self-Care influence every aspect of your life and I want to cover them all. It's so important to take care of every aspect of yourself. You are so important. Choose what you need. 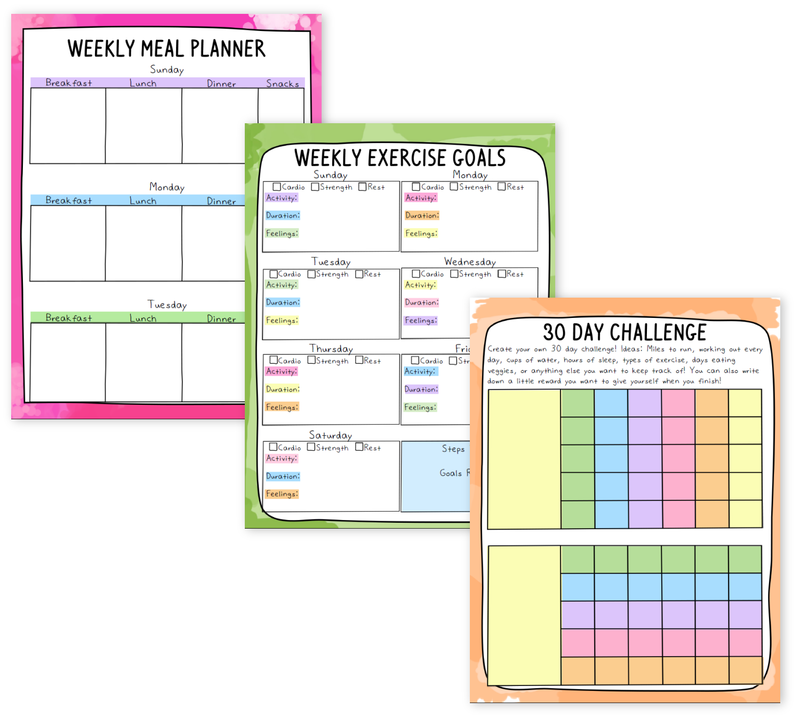 Pick the worksheets that will help you improve your life and then do the work. It all ends and begins with you. 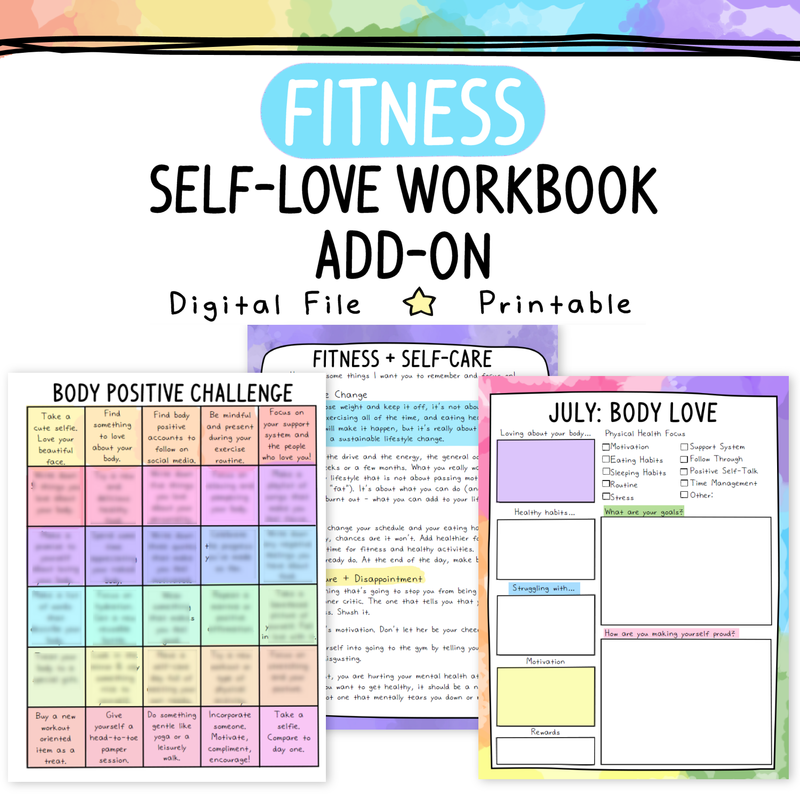 The Fitness add-on is all about focusing on self-love as you workout, lose weight, and focus on healthy eating. It's so easy to fall into the trap of "hating yourself thin". This is a different approach that focuses on loving yourself through the process of being healthy and loving your body at any size. This .pdf is 32 pages. There are three versions: Black and White, Watercolor, and Rainbow, you get all of them! 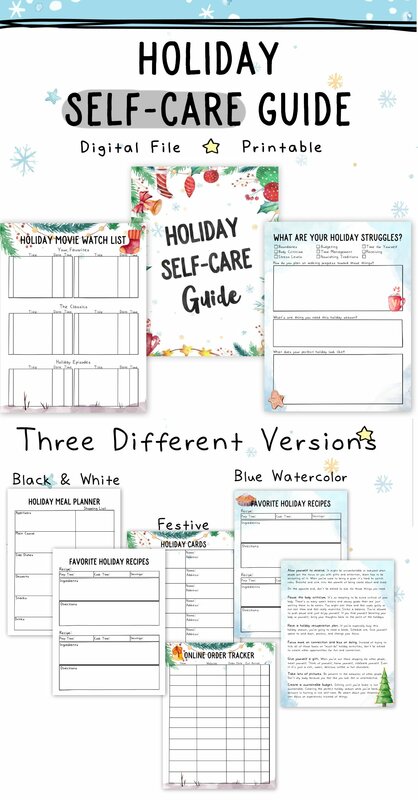 The Holiday Self-Care Add-On is full of self-care tips AND worksheets to help you have a happy and organized holiday season. It's so important to take care of yourself all year round but if you're sensitive, anxious, and prone to depression, the holidays can bring up a lot of stuff. These pages will help you focus and have an awesome holiday. This .pdf is 24 pages and comes in three different versions, black and white, blue watercolor, and a festive theme. All have fillable forms enabled which means you can fill them out right from your computer. 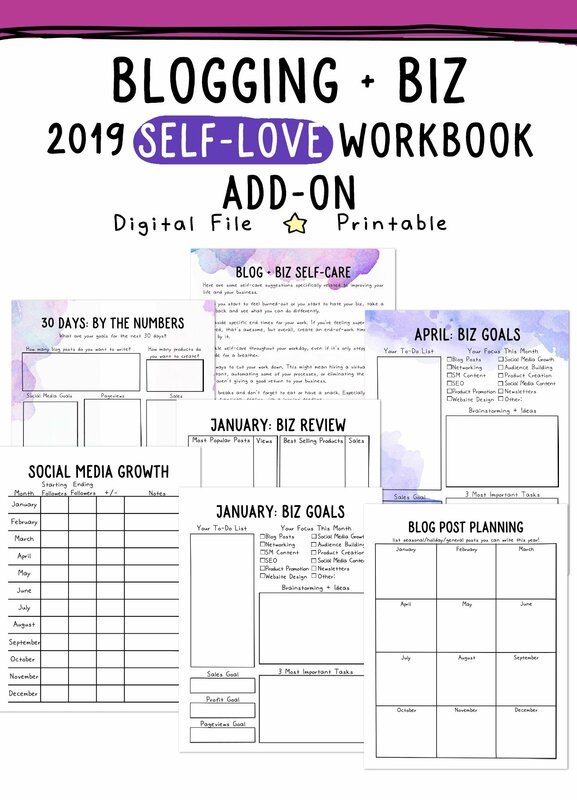 The Mental Health add-on has worksheets to help you pinpoint where you struggled in 2018 and what goals you want to create for 2019. 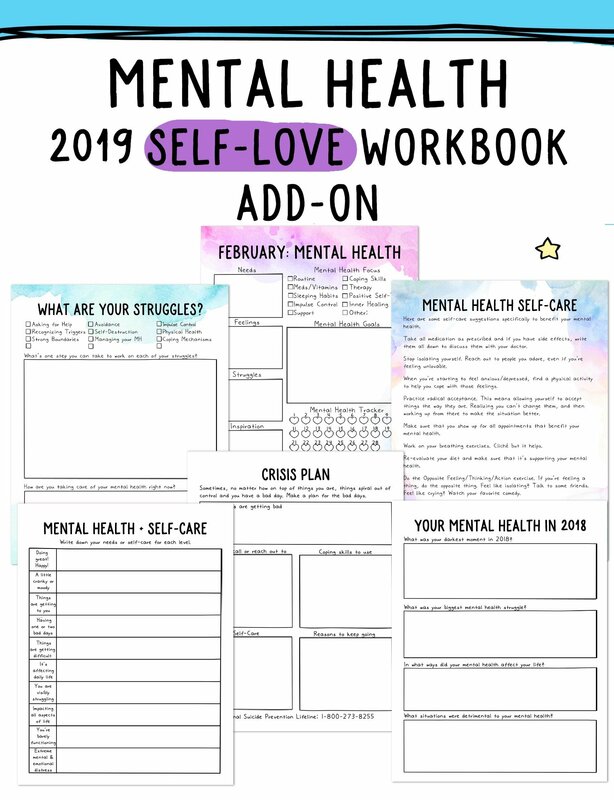 There's a crisis plan worksheet, a list of great self-care ideas specific to mental health, and a monthly check-in page to help you track your mood and document your struggles, feelings, and your mental health goals. The Witch add-on is all about spirituality and paying attention to your spiritual path. These worksheets will help you keep track of the moon cycles and the turning of the seasons. Review your spiritual practice in 2018 and then make plans for 2019. There’s a spot for spellwork, tarot/oracle readings, full moon plans, and spiritual goals! This .pdf is 24 pages. The Parenting add-on encourages you to be kind to yourself and take care of yourself as you embark on the hardest job in the world, raising kids. 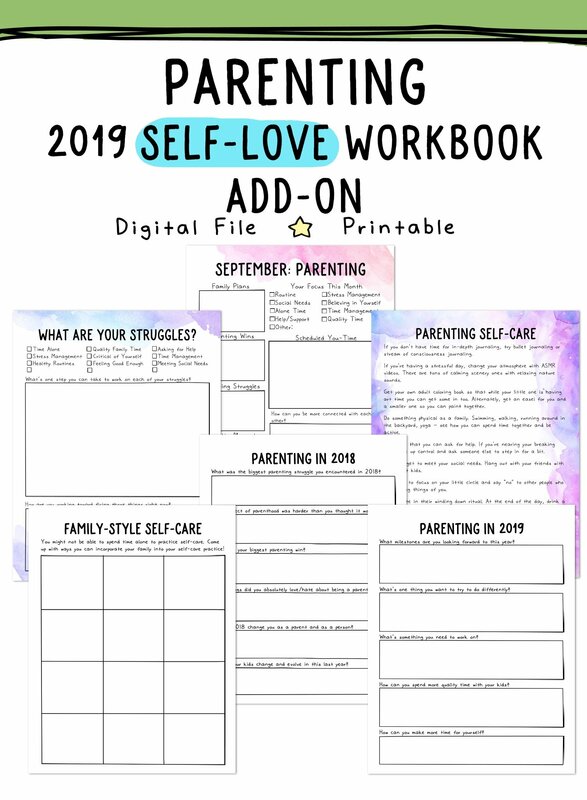 The worksheets encourage you to make time for yourself and also make self-care a family activity. It's so important to practice self-care, take care of yourself, and meet your needs. This .pdf is 23 pages. The Sobriety add-on encourages you to put your sobriety first. 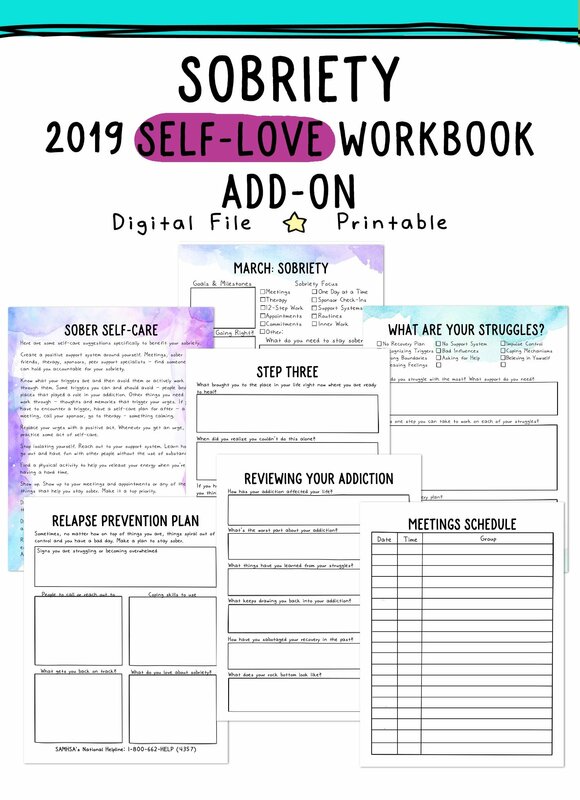 There's a relapse prevention plan, reviewing your addiction, embracing sobriety in 2019, as well as worksheets to help you on your 12-step journey. There is a check-in for each month so that you can see what you're struggling with and where you need to focus your time and attention to continue in your recovery. This .pdf is 47 pages. The Relationship add-on encourages you to have a healthy relationship by creating a healthier you. Lots of relationship issues are caused by lack of love and self-worth or the inability to communicate your needs (because you feel unworthy) or lack of boundaries (because you're afraid of abandonment). Take a look at your relationship and your needs. This .pdf is 25 pages. 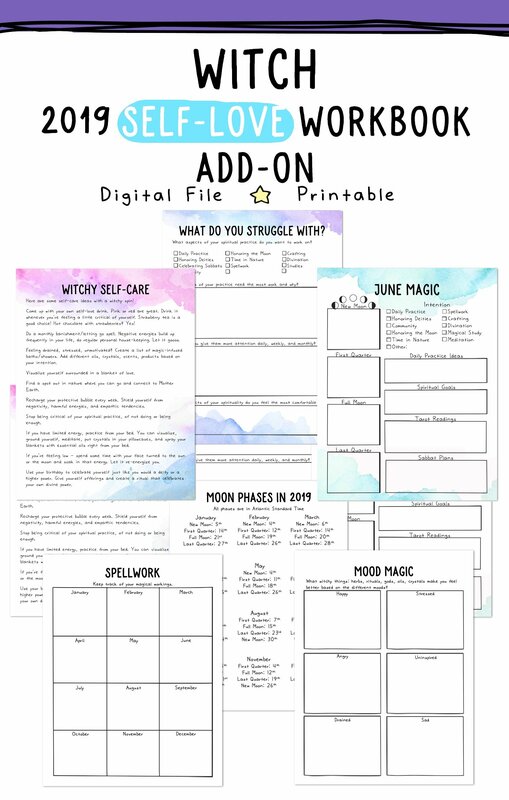 The Blogging + Biz add-on has everything that I, as a blogger, would want to find to keep me organized. Review how your business went in 2018 and then make plans for 2019! Make goals and use the blog and product planning pages to create an outline for what you want to create this year. Keep track of your social media following, income, and popular blog posts! This .pdf is 39 pages. Some of my digital products are free to non-profit/not-for-profit organizations are groups. If that's you - fill out this form and I'll get back to you! If you'd like to show your appreciation, buy me a cup of coffee! *	Do you work for/represent a Non-Profit or Not-For-Profit? This is a MUST. Any organization that qualifies as a non-profit, not-for-profit, or who helps people for free. Schools, churches, shelters, charities, support groups, substance abuse programs, domestic violence programs, are all eligible. *	Can I list your organization on my website? *	Tell me a little bit about your organization or what you do!